During the fall of 2015, we demolished part of the old and ruined fishing platforms along the Old-Drava. This task was a long time coming, as these messy platforms and their surroundings were an eye sore in the oxbow. In recent decades, many of these platforms were built not out of properly selected building materials but hastily chosen bits and pieces and became quickly ruins after desertion. During the autumn, we made a survey about which of these platforms were not needed. We identified more than 30 in total, which were then torn down. 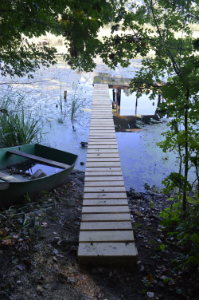 In the place of them, new fishing platforms and three community purpose jetties were built. The jetties are larger, can fit more people and are suitable for overlooking the whole oxbow from the shore; therefore, even presentations can be held on them for smaller groups about the Old-Drava. 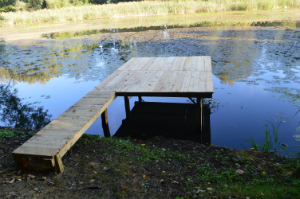 The new platforms are managed by the fishing association and holders of a valid fishing license can use them. The platforms were built on a fixed height and were based on the same design. The criteria of the good natural state require that fishing conditions are resolved along the Old-Drava. Fishing does not have to come with constructing booths and littering. Mainly locals go fishing at the Old-Drava, but in a much smaller number compared to previous periods. This can be changed by improving the conditions of fishing and by raising awareness. The ideal outcome from nature conservation and social point of view would be if people visit the Old-Drava because they feel it belongs to them, they are proud of its values and want to take care of it for future generations. Our work of removing the old and ruined platforms and building new ones instead, created one of the conditions for this ideal result.